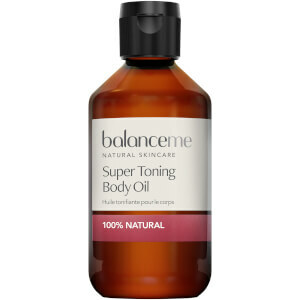 Treat your skin to the benefits of Balance Me's Super Moisturising Body Oil; a 100% natural formula that helps to restore softness and suppleness from top to toe. Infused with a host of beneficial ingredients, including Neroli, Starflower and Rosehip Oils, the luxurious oil moisturises and hydrates skin as it combats dry, flaky patches for long-lasting comfort. Packed with vitamin, antioxidants and essential fatty acids, the nut-free blend improves elasticity and minimises the appearance of stretch marks, making it beneficial for use during pregnancy. Skin feels smooth, replenished and rejuvenated without greasy residue. Налейте небольшое количество масла на ладони и нанесите его на кожу массирующими круговыми движениями. Уделите особое внимание зонам, склонным к сухости или образованию растяжек. Используйте масло утром и вечером. Для профилактики или лечения растяжек втирайте масло массажными движениями непосредственно в проблемную зону до полного впитывания. Vitis Vinifera (Grape) Seed Oil, Helianthus Annuus (Sunflower) Seed Oil, Sesamum Indicum (Sesame) Seed Oil, Triticum Vulgare (Wheat) Germ Oil, Simmondsia Chinensis (Jojoba) Seed Oil, Rosa Canina (Rosehip) Fruit Oil, Cocos Nucifera (Virgin Coconut) Oil³, Borage Officinalis (Starflower) Seed Oil, Calendula Officinalis (Calendula) Flower Oil, Tocopherol (Vitamin E), Citrus Aurantium (Neroli) Flower Oil¹, Citrus Reticulata (Mandarin Red) Peel Oil¹, Citrus Aurantium Amara (Petitgrain/Bitter Orange) Leaf/Twig Oil¹, Anthemis Nobilis (English Chamomile) Flower Oil¹, Limonene², Linalool², Farnesol², Geraniol². (¹) natural pure essential oils, (²) naturally occurring in essential oils, (³) certified organic ingredient.